Clean water is essential to our health, our communities, and our lives. Yet our water infrastructure – drinking water, wastewater and stormwater systems, dams and levees – is seriously outdated. In addition, we have degraded much of our essential natural infrastructure – forests, streams, wetlands, and floodplains. Global warming will worsen the situation, as rising temperatures, increased water demands, extended droughts, and intense storms strain our water supplies, flood our communities and pollute our waterways. The same approaches we have used for centuries will not solve today’s water challenges. We need to fundamentally transform the way we manage water. 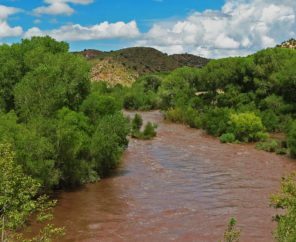 Protect healthy landscapes like forests and small streams that naturally sustain clean water supplies. Restore degraded landscapes like floodplains and wetlands so they can better store flood water and recharge streams and aquifers. Replicate natural water systems in urban settings, to capture rainwater for outdoor watering and other uses and prevent stormwater and sewage pollution. This report highlights eight forward-looking communities that have become more resilient to the impacts of climate change by embracing green infrastructure. They have taken steps to prepare themselves in four areas where the effects of rising temperatures will be felt most: public health, extreme weather, water supply, and quality of life. 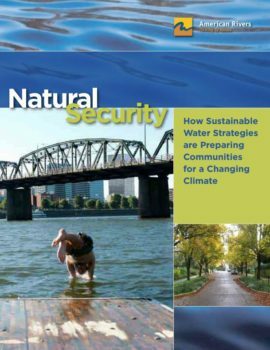 In each case study we demonstrate how these water management strategies build resilience to the projected impacts of climate change in that area and how the communities that have adopted them will continue to thrive in an uncertain future.